Parsnip pear soup is sweet and savory, creamy without the cream, and a nutritious and delicious addition to a fall or winter meal. Garnish with tart cranberry coulis for a pop of color and festivity. I love soup. I eat soup all year round, even on 90 degree days during the summer. And I’m not just talking about cold soups like gazpacho, though I’m a fan of that too. What I really love is a hot bowl of soup, much like this parsnip pear soup that warms me up from the inside out. It doesn’t matter whether it’s a hearty vegetable soup, brothy chicken soup, chunky chili, or a smooth pureed soup – I’ll eat them all. I seriously could eat soup every single day, that’s how much I love it. Do you agree? 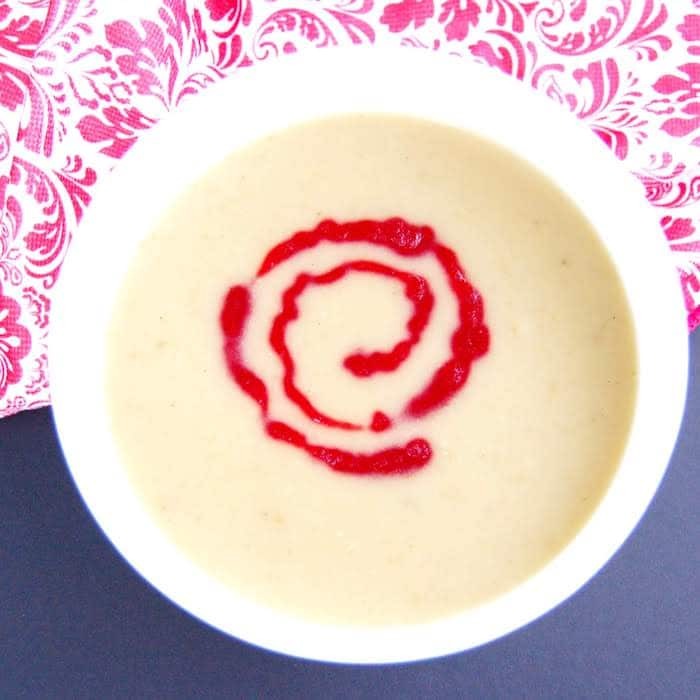 If so, you definitely want to check out this creamy parsnip pear soup! Like many of my favorite soups, this Creamy Parsnip Pear Soup is a velvety, creamy puree without any cream, making it the perfect dairy-free appetizer or main dish for those who follow a vegan diet, have a dairy allergy or intolerance, or keep Kosher (like we do) and want to serve it at a meat meal. And while some creamy soups add bread for heft if they omit the cream, this parsnip pear soup is completely gluten-free. Similar to the way the roasted butternut squash and sweet potatoes are creamy on their own in my Roasted Butternut Squash and Sweet Potato Soup, the creaminess here comes solely from the starchiness of the parsnips. Since parsnips and pears are naturally sweet, this creamy parsnip pear soup provides you with the sweet and savory flavor combo, which I love. There are an additional two tablespoons of maple syrup in the soup to add a depth of flavor and bring out the natural sweetness that’s already there, while fresh thyme adds a subtle earthy flavor, which works well with the parsnip. This soup recipe is relatively easy to whip up and the result is a nutritious and delicious bowl of soup that will satisfy your family and impress your guests. My girls were amazed when I told them about this soup. Pears in soup?! That was a new one for them and probably will be for some guests to your home too! 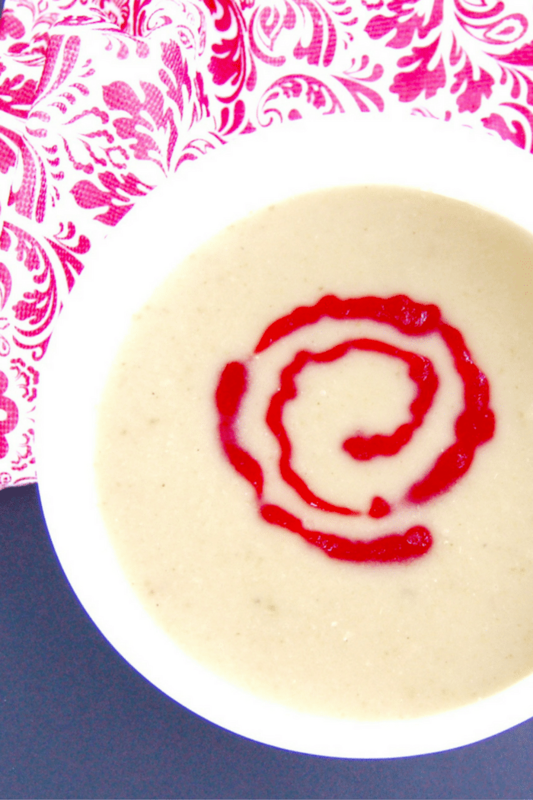 The cranberry coulis drizzled on top of this soup is optional, but I highly recommend it. It’s made the same way you make cranberry sauce, except that it needs to be strained, which is a bit tedious but well worth it in my opinion. The coulis is very low in sugar (only 1/4 cup per 1 cup of cranberries) so it’s still quite tart, which provides a nice balance to the sweetness of the soup. Of course since cranberries are a popular ingredient on all holiday menus this time of year, the coulis is a perfect addition for an upcoming holiday or New Year’s party. In fact, when I make this parsnip pear soup for a party, I like to serve it in small tasting cups with demitasse spoons – perfect for everyone to have just a taste and save room for the rest of the hors d’oeuvres on your menu! Parsnips and pears join together in this sweet and savory soup that's creamy without the cream, naturally sweet, and a nutritious and delicious addition to a fall or winter meal. 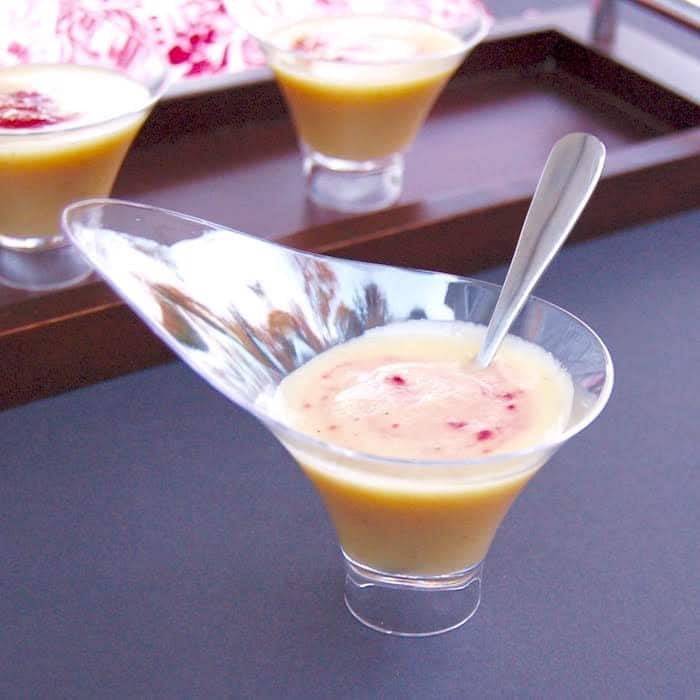 Tart cranberry coulis provides an elegant topping and flavorful contrast to the sweetness of the soup. Serve as an appetizer or in smaller servings as a festive holiday party hors d'oeuvre. In a medium to large soup pot, heat oil over medium-high heat. Add shallots and garlic and saute for 2 minutes, stirring frequently, until shallots have softened and become translucent. Add parsnips to the pot and cook 2 minutes, stirring occasionally to make sure the shallots and garlic don't stick to the bottom of the pot. Lower heat to medium, cover the pot, and cook 5 minutes until parsnip is tender and starting to brown. Add pears to the pot and stir. Cover the pot and cook another 5 minutes, stirring occasionally. Uncover the pot and add broth and thyme. Raise heat to high and bring soup to a boil. Reduce heat, cover pot, and simmer for 20 minutes. Remove soup from heat, uncover, and let cool 5 minutes. Using an immersion blender, puree soup until smooth. Return soup to medium heat, add 2 cups water, and simmer 10 minutes. Stir in maple syrup, white wine vinegar, salt, and pepper to taste. Add lemon juice and remaining tablespoon of water to cranberry coulis and whisk to combine. 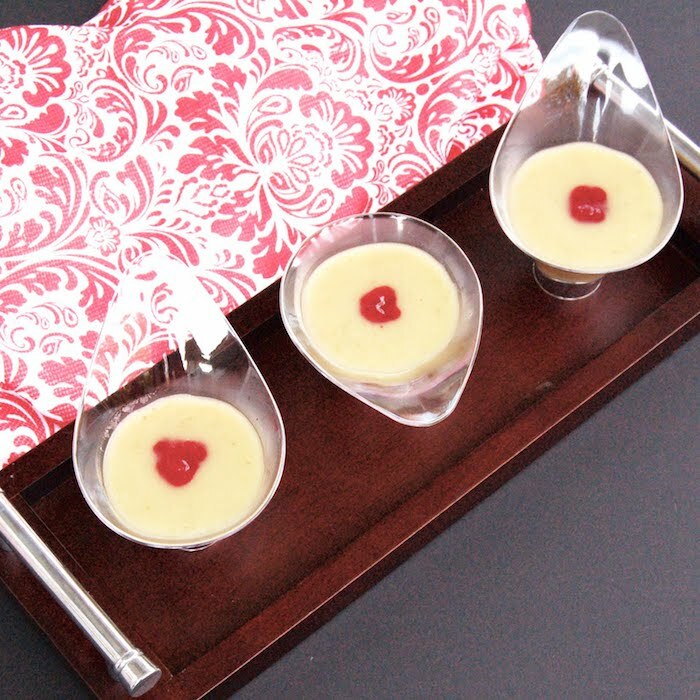 Serve soup with cranberry coulis drizzled on top. *Any type of pear can be used. I have made this with both bartlett and d'anjou pears. I leave the skin of the pear on for more fiber, but pears can be peeled if preferred. **I like to save the solids of the cranberry coulis and use as a spread on toast or my Spiced Pumpkin Bread. Do you enjoy soup all year long? Have you ever added pears to soup? Share your responses with me in the comments below! Love parsnips and pears. This soup looks delicious! Sweet comfort! I love that little cranberry swirl going on too! Thanks Rebecca! Doesn’t it make it extra festive?! My girls couldn’t get enough! Thanks for sharing! I just made this and it turned out great! The flavor combination is delish and I love how creamy it came out. So excited to include this recipe in my upcoming cookbook. Thanks, Jessica! 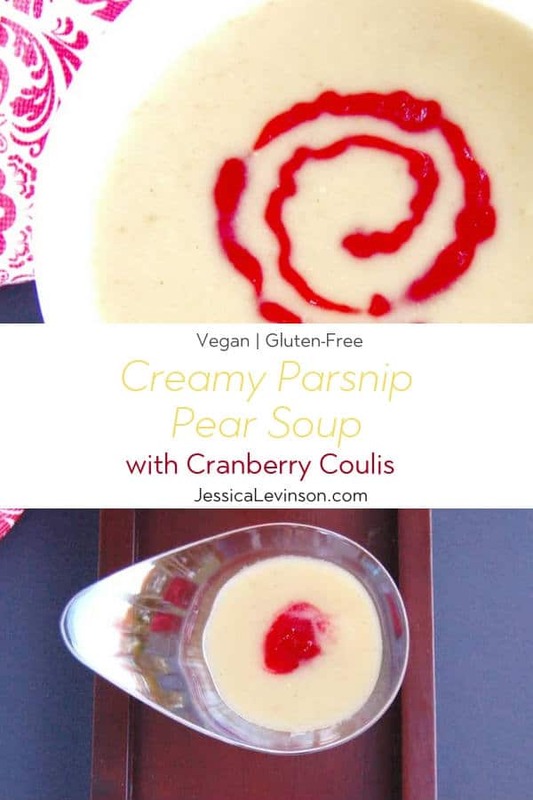 I have never tried the combo of parsnips and pears, but this soup sounds delicious – especially with the coulis! Plus, another reason to use my immersion blender is a good one for me – (my husband complains I buy too many kitchen tools and don’t use them enough)! Brittany, you must try the combo – it’s super delish! And tell your husband not to worry abt the immersion blender. There’s SO much to do with it. I have two – one for meat and one for dairy since we keep a Kosher home – and I use both all the time! Fun recipe and love the cranberry swirl on top! I made something a little similar way back when I started my blog-Parsnip and Apple Soup. It was super tasty, but my food photography skills were NOT good-I definitely need to go back and re-visit that one, with better photos 🙂 This looks delicious! Thanks EA! Parsnip and apple is super yummy too. Can’t wait to see when you reshoot that – I have no doubt it will be stellar! Thanks so much Emily! Would love to know how you like it! Pears are awesome in soup! I did a pear butternut squash soup last year. So yummy! I totally agree and am so glad to hear others have had it before. I bet it was amazing with squash!! How beautiful! I love parsnips but don’t have them often enough. Love this recipe and will be trying it soon. Thanks Mona! Hope you give it a try and would love to know what you think! I eat soup year round too! I love it! This sound so good, especially with the sweet and savory combination. Pears are my favorite, definitely trying this one soon! Thanks Kaleigh! Hope you like it as much as I do. Would love to hear what you think! Simply delicious and perfect for the holidays, or any chilly day really! So pretty too! Thanks Sarah! I agree – it’s great all winter long! It’s a great way to add natural sweetness. LMK if you try it Deborah! I’m not a huge soup fan but I love the sweet and savoury of this recipe. I will have to give it a try! ahhhh i love soup all year round, especially during the fall and winter! Please do let me know if you try it! I love the small plating of the soup. Great for a holiday party! Thanks Abbey! That’s how I’ve served it for cocktail parties. This is a perfect soup for that style since a little goes a long way! Thanks Rebecca! Parsnips don’t get enough love IMO! This is a great way to incorporate them! Sounds delicious and would be so good right about now! Brrrr! Let me know if you try it Rachel! Wish I had more left! Wow. This sounds so interesting. I have never had Parsnip soup. I may just have to try this one out. I hope you do try this parsnip pear soup Mikki. It’s a really nice twist from classic soups of the season. The colors and flavor combo of this soup are amazing. I bet it’s really comforting and I love cranberries so I need to try it! I’ve never had a parsnip soup, and don’t have them much in general. Thanks Sarah. I really hope you give it a try! I have never tried parsnip before! It is definitely getting soup weather so I may have to give this recipe a try. Thanks for sharing! Oh my goodness, you must try parsnip! I love it cubed and roasted, braised with meat, added to chicken soup, and of course in this soup too! LMK if you try it! I’ve never made soup with parsnips and this sound sooo good!! Such an interesting combo. Can’t wait to try this. I hope you try it Deryn! It’s quite delish. This looks wonderful! I don’t have too many go-to parsnip recipes – aside from adding them to soups or roasting them with maple! – so I definitely want to try this. I love parsnips in both those ways too, but this is definitely a more unique way of using it. Can’t wait to hear how you like it!